Just heard over the Fox channel morning news today that Indiana has quite a cold and white morning. 10 inches of snow was reported in some areas as cold air is pulling cool air down from the bay to Indiana suburbs. While this is really no cause for anything out of the ordinary, it does usher in the winter season in a reminding fashion of fun, games and… snowmen! After you get over the magic of first snow I’m sure you’d quickly be reminded that it’s almost time for a snowball fight too. Better to arm yourself wisely with the Snow Launcher as early as you can. It’ll be gone in most stores soon because at about under $30, it is a steal. 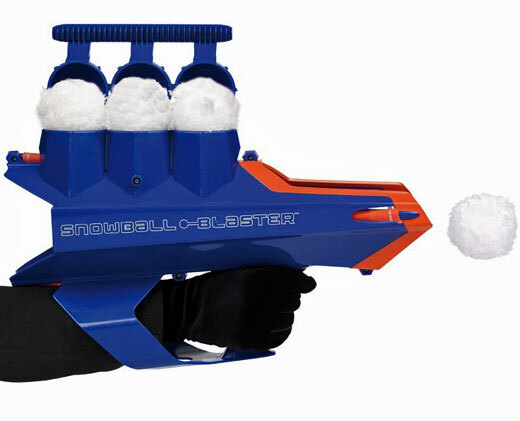 Move over Nerf guns… we need the snow launcher right now. It looks and probably feels like it’ll turn you into a Halo character, with the launcher able to throw as far as 80 feet. The easy snow packing utility on top makes sure you can quickly reload, even while under fire. The Douchenator Water Balloon Launcher: I Want One!